Oxfam India calls for Canvas for Climate Change - an event aimed at spreading awareness about the impact of climate change on the average person, especially on poor people in the rural and urban areas. 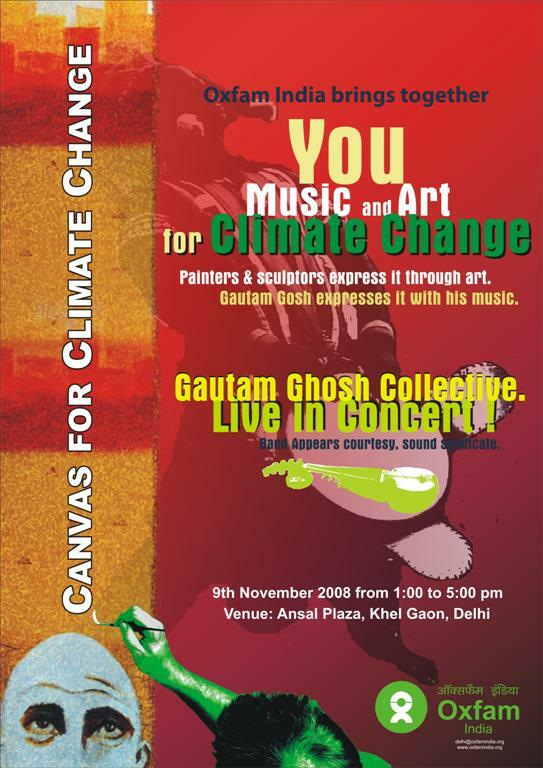 You Music and Art for Climate Change, will see painters and sculptors spread the message through art, while Gautam Ghosh and his band will say it through music. Date: 9th November, 2008 (Sunday) Time: 1.00 - 5.00 PM Venue: Ansal Plaza, Khel Gaon, New Delhi Some well known painters like Shafi Quereshi, Joyattam Dutta Roy, Sanjay Soni etc. and sculptors like Mir Imtiaz are joining hands to be part of the activities. The paintings on the canvas will be about ordinary people, how they are affected and what they are doing to deal with this.